Daniel Hines Entzminger is a lifelong resident of Pitt County. At the age of 12, he began working at the Dixie Queen Seafood Restaurant in Winterville for his grandfather, George Hines. While employed in the restaurant business, Daniel learned a lot about hard work, and about how to connect with and relate to other people. Those lessons that he learned while working in the restaurant have proven to be invaluable tools in his representation of clients during the last 12 years of practicing law. Those lessons have enabled him to be assertive on behalf of his clients, and have allowed him to also achieve strong results. While in law school, Daniel not only learned about the law, but he also gained practical experience as he worked as a third year law student for the Pitt County District Attorney’s office. During that time, he gained valuable trial experience, prosecuting numerous cases in Pitt County, including traffic violations, assault cases, and DWIs, while obtaining numerous convictions for the State. After completing law school, Mr. Entzminger began his legal career with the Law Office of Richard L. Griffin, PA, in Greenville, NC. While working for Mr. Griffin, he practiced in multiple areas of law, including criminal defense, civil litigation, real estate, and will preparation, providing quality legal services to the citizens of Pitt County. 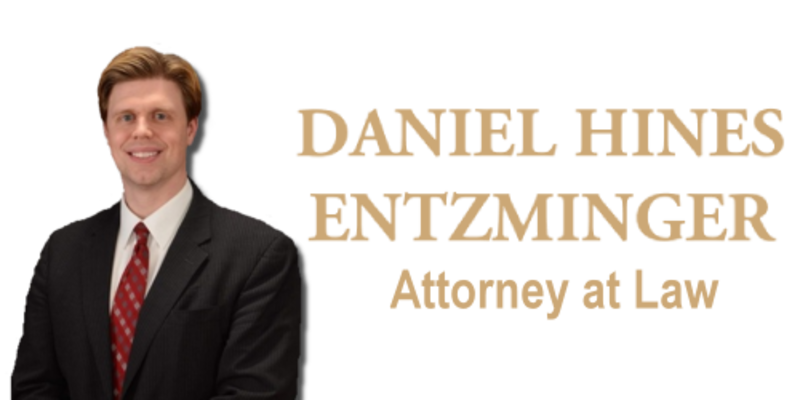 After working for Mr. Griffin for 2 years, Mr. Entzminger decided to take on the challenge of starting his own law practice, the Law Office of Daniel Hines Entzminger, PA. At the Law Office of Daniel Hines Entzminger, P.A., he continues to represent clients in the District and Superior Courts of Pitt and surrounding counties. In addition to his professional career, Mr. Entzminger also tries to give back to the community. He currently teaches Business Law as an adjunct instructor at Pitt Community College, and has done so since 2005. He also volunteers as a youth soccer and basketball coach.